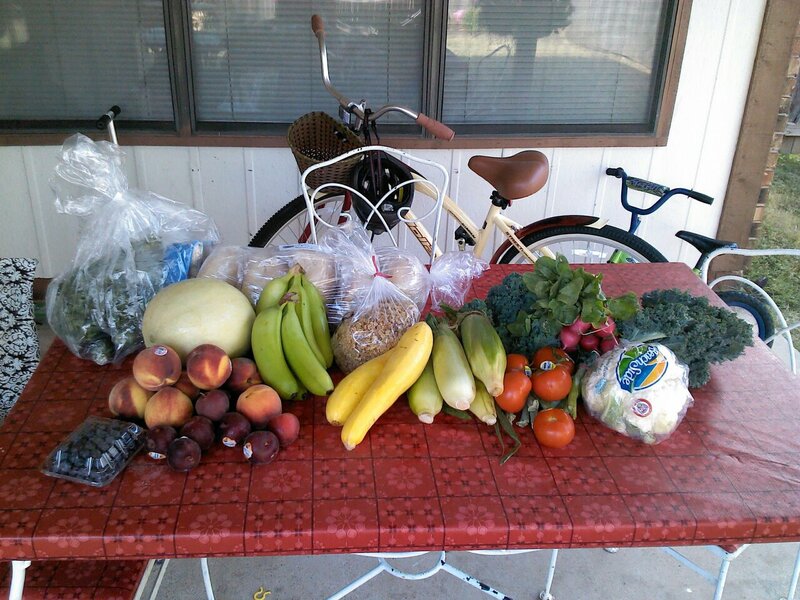 I told y’all I would be picking up an order from the Bountiful Baskets produce co-op. I got my first order today, and though I had been expecting a lot from the rave reviews my friends were giving me, I was still very pleasantly surprised by the actual amount and the condition of the food I received. How to prepare some of the produce is a mystery to me, but the group website offers a blog with tips and ideas for how to get the most out of your basket. And I discovered, from the Facebook page, that those weren’t plums after all, but delicious, delicious, delicious, juicy, ripe black velvet apricots. My entire Bountiful Baskets haul. This includes the regular basket (all the fruit and produce you see loose), a hefty baggie of really good granola, an Italian veggie pack, and 5 loaves of sourdough bread. Description: Roughly 50% fruit, 50% vegetables, and 100% healthy, fun and delicious! Item Name: Veggie Lovers Pack – Italian Theme – Add extra veggies to your basket! Making dinnertime fun! Description: Veggie Lovers Pack – Italian Theme – Add extra veggies to your basket! Making dinnertime fun! Italian Pack – Hoping for garlic, basil, oregano, rosemary, yellow and red onion, flat parsley, zucchini, regular mushrooms and eggplant. This is the Italian Veggie pack I added to my basket order. 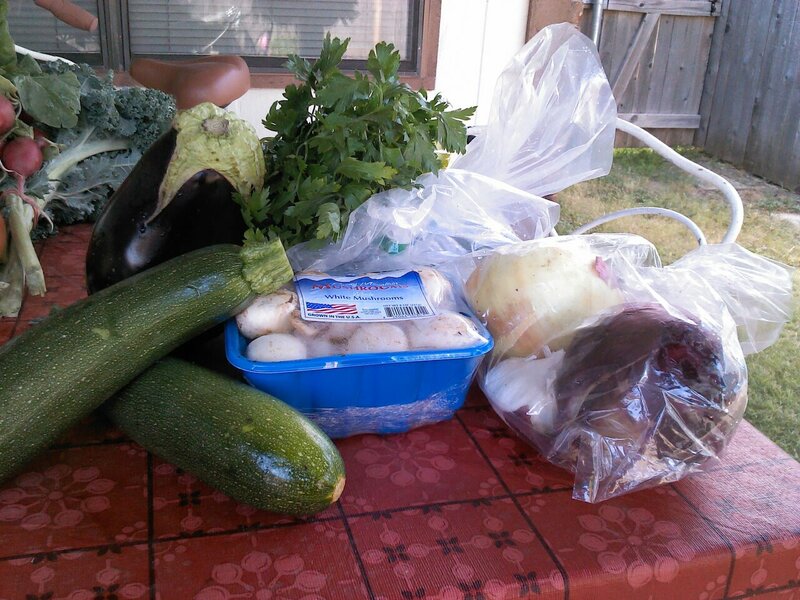 For $15, I got fresh and pungent baggies of basil, oregano, and rosemary, a huge bunch of cilantro, mushrooms, a medium sized eggplant, a huge red onion, a large yellow onion, and a medium sized clove of garlic, and two zucchini. 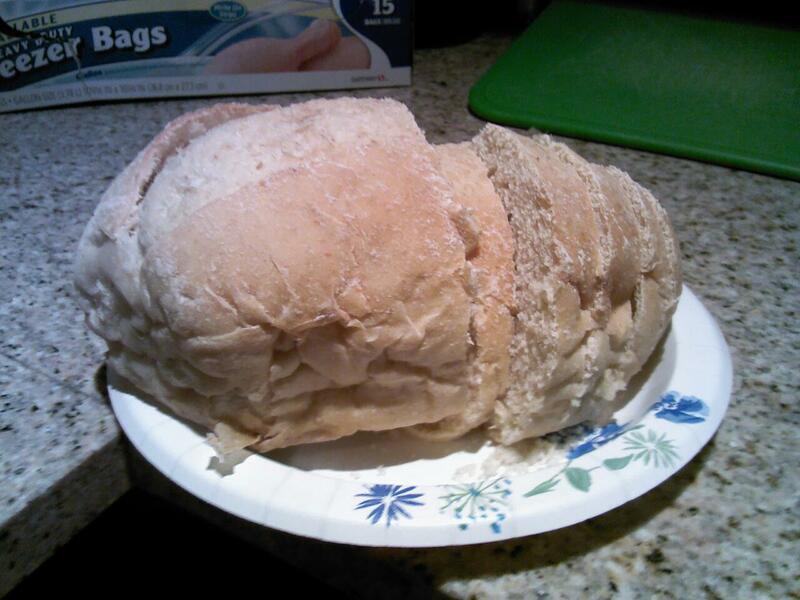 One of the 5 loaves of sourdough I bought with my Bountiful Baskets order (the rest is in the freezer.) I tried some toasted and slathered with KerryGold butter. I had to stop myself from trying more. Description: Ingredients – Oats, Honey, canola oil, roasted & salted cashews, dates, diced pineapple, sunflower seeds, sesame seeds, sliced almonds, and almond & vanilla flavor. As far as I am concerned, this was a great deal. I can’t get out of the grocery store for those prices. Well worth the cost! I think Thor will enjoy shucking the corn with me. I haven’t done that since I was a child, and I’m not sure he’s ever seen corn in its natural state. Check into the co-op and see if they have one in your area. They are across the country and have a lot of locations! FYI….what you think is cilantro in the Italian pack (it’s not used in Italian cooking at all) is actually flat leaf Italian parsley.